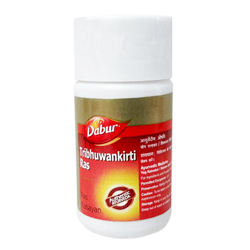 Dabur Tribhuwankirti Ras Ayurvedic Medicine Product For Fever, Cold, Cough, Bodyache and Tonsillitis. Dabur - RAS RASAYAN - Worldwide Shipping. Tribhuwankirti Ras for Fever, Cold, Cough, Bodyache and Tonsillitis. Acute and relapsing fevers associated with cold, cough, bodyache, tonsillitis. Also recommended in measles. 1 to 2 tablets (125 to 250 mg.) in the morning and evening with honey or as directed by the Physician. Milk or water boiled with ginger or long pepper. Barley water, Sweet lime (Mausmi), Pomegranate. Rice, Chillies, Fried and heavy foods.